I help motivated women reduce stress, feel great in their bodies and build lifelong habits so that they can feel whole again. Hi! My name is Heidi and I'm a holistic life coach. I use the teachings of Ayurveda & yoga, contemporary research on habit transformation, life coaching and the experience from my own journey from an out-of-balance business owner to a MUCH happier & healthier human being as the basis of my process. 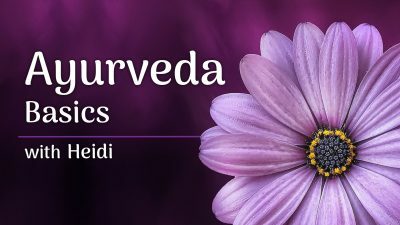 Trained as an Ayurvedic Health Counselor and RYT yoga teacher, I've traveled the path from overwhelm, anxiety and being overweight to a life of balance and joy. I love helping women tap into their own capacity for healing body, mind & spirit, to reveal the inner joy that makes life worth living. Wake up in in the morning and be instantly flooded by anxious thoughts? Feel too tired to get through the workday without stopping by the snack station for a coffee and a treat? Want be a better person for the people you love but don't know how to change? Start a self-help program but two weeks into it get overwhelmed with life and never get back to it? Again, and again, and again? You wake up (without an alarm clock! ), stretch, and jumpl out of bed feeling excited to start your day. You suddenly realize that you've forgotten about your digestive issues that you've had for years because they've gone away. You finish work feeling relaxed, calm and with energy to spare - despite the stress and chaos of the day. You lay down in your bed after a busy day and instantly falling into a deep, nourishing sleep.